The Quiet Mind Refresher is a short 2-3 hour session for past Quiet Mind course students during which you can refine and tweak your practice, learn further ways to establish the essential practice habit and develop your understanding among friends. Loose fitting clothing and your meditation diary (if you’ve still got it!). Everything else will be provided. The session runs from 7pm to 9:30pm (please arrive promptly) and will include revisiting the main teachings of the Quiet Mind course with an emphasis on getting over pracice blocks and refining some of the meditation strategies. Discussion/Q & A will be an important element but there will be a focus on the practical side of things. 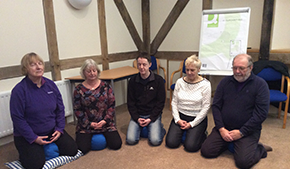 The refresher is a wonderful way to rekindle/restart your practice and keep in touch with fellow Quiet Mind Students. What happens next? How do I book? When you book your place on our calendar we will contact you by email a few days prior to the with full joining details.